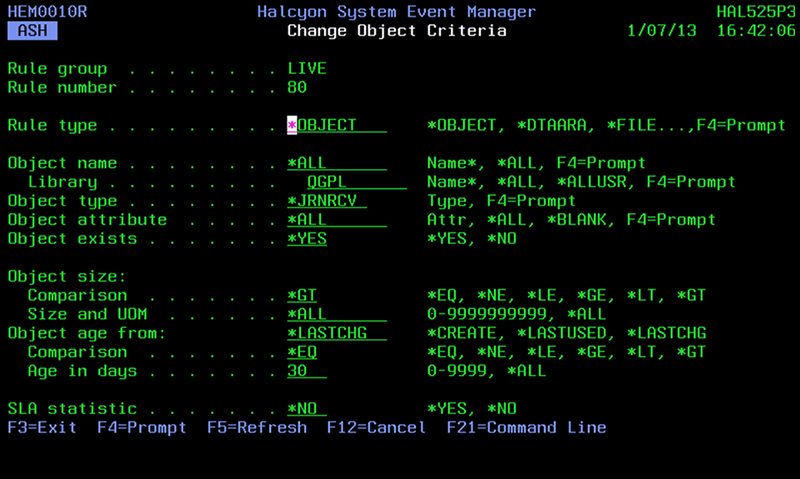 Object Monitor now allows you to check any object within the IBM i environment by age, so that you can quickly and easily clean up Journal Receivers, based on date. Put simply, this new functionality allows you to quickly find and delete Journal Receivers, which can take up large volumes of valuable disk space, by their date - enabling efficient house-keeping of your IBM i platform. As you already have your back-up process running and your HA replication process in place, you do not need to retain the Journal Receivers indefinitely - you can set up a business rule with Object Monitor automatically to delete them after a set time frame. However, if you do not want to automatically delete the Journal Receiver, you can set up an alert with Object Monitor to notify you that an excessive number of Journal Receiver exists. It is also good practice to keep track of what is consuming your disk by having the ability to track and be notified if system wide thresholds are breached. You can use Object Monitor, to not only define these system wide thresholds but also raise alerts based on either the size of the library or the number of objects contained within it. This is particularly useful if you know that a library should contain an exact number of objects, as you can set up your monitoring rules so that you would be alerted to this library containing a number more or less than what is expected. This will ensure that you are made aware of the issue so that you can investigate further and remedy the situation.